From the inside cover: Just in time for the holidays, Anne Perry gives her fans a marvelous gift: a new yuletide yarn full of light celebration and dark mischief. Dominic Corde is thrilled to "fill the robe" as substitute vicar in the village of Cottisham while the Reverend Wynter is away on a three-week Christmas holiday. Glad to escape his dreary London flat and a less-than-satisfying job as church curate, Dominic and his beloved wife, Clarice, set off for what they hope will be a lovely winter getaway. Upon arrival, in the midst of a frigid exceptionally snowy season, Dominic and Clarice are welcomed by warm, hospitable neighbors and enchanted by the cozy, inviting vicarage. Everything seems almost too perfect. Dominic's only concern is how he will be received by the congregation, who hold the Reverend Wynter in such high regard. But as Clarice soon discovers, she and Dominic have much more dire matters to worry about. It turns out that the Reverend Wynter isn't on holiday at all--and that something very sinister has transpired. Anne Perry is known for her dark Victorian era mysteries with Thomas and Charlotte Pitt and William Monk. I do enjoy those two series, but they take more work for me to read. More concentration and working through the language and manners. 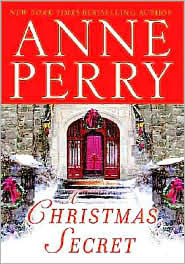 Perry's holiday mystery books are much lighter, almost cozy in nature. At least the two I've read are cozy since I don't remember a policeman solving the murders. This one has Clarice feeling compelled to figure out what has happened in what she hopes will be a home for her and Dominic. Compelled because it's the right thing to do morally and for peace of mind. I liked how the story spun itself out for me figure out along with Clarice and Dominic. I like their relationship and how they interact with the villagers. I'll look for one of the others next Christmas that's for sure.